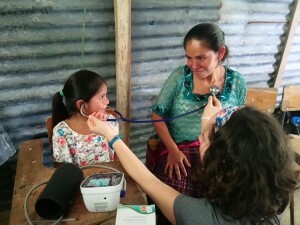 I am so grateful to One Nurse at a Time for providing me with the opportunity to connect with Guatemala Village Health, an NGO out of Seattle, WA that provides visiting clinic care to remote Mayan villages in the mountains of Guatemala. As a Jo’s Nurse, it was important for me to work with a group that had built a system providing some continuity of care since I disliked the idea of a trip that simply provided medical interventions to a community then disappeared from their lives. I enjoyed GVH for their dedication to the communities they have elected to visit, as many of the villages see the medical clinic team as often as three times a year and receive nursing visits every 6 weeks for family planning care. 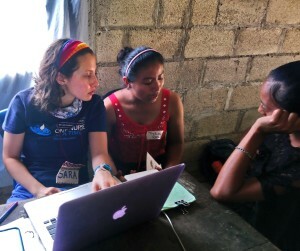 Our team consisted of 15 visiting volunteers, with most of the team being health providers, three of us nurses. 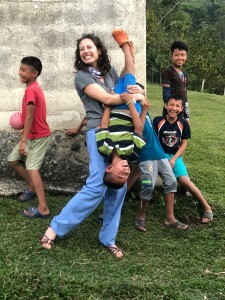 We had ten Guatemalans traveling with the group, as well, which included one nurse and three health promoters who spoke the local Mayan language of Quiche. The group set up ten clinics in total, seeing anywhere from 30-75 patients a day based on the size of the community and duration of time since our most recent visit to the village. As a relatively proficient Spanish speaker, I went into the trip understanding a cultural barrier would be present but I could hopefully bridge the language barrier. As a Nurse, my job was to triage patients, identifying who needed to see our lab services, the health promoters for common ailments, or had an acute issue that required a visit to a medical doctor or advanced practitioner. It was a consistent struggle trying to identify community members who could act as Quiche to Spanish interpreters and also keep them in place long enough to get through our triage process for more than a few patients. This aspect of medical care made me uneasy at first, knowing that other members of the village, often friends or even individuals of the opposite gender, were actively listening to another person’s medical history and sometimes very personal women’s health issues. This proved ethically difficult for me at first since I could often note a level of embarrassment or shyness in their faces even if we didn’t speak the same language. After the first couple clinics, I became more comfortable with these circumstances upon reflection – I could best benefit my patients by obtaining the most comprehensive understanding of their situation to better help with their medical concerns. Most of the patients came in for medications to resolve aches and pains, skin issues, or dehydration so these cases were simpler to triage quickly and send to the proper individual in clinic. But in the case of those patients present for inguinal pain, vaginal bleeding or pregnancy concerns, I was glad to have took the time to ask the important questions, with interpreter or not, because these individuals often listed their chief complaint last after their more common aches and pains and may not have received the proper care without an translator present to assist. On busier days when we saw more patients, I was both physically and mentally exhausted. This may have been my personal lack of proper hydration while talking with patients for hours, or my brain out of commission after utilizing it to think in two languages which I seldom get to do at home. Yet, at the very end of the day when I was finally ready to settle in for the night, none of these thoughts crossed my mind. Instead, I focused on the simple things I often take for granted such as potable water, no language limitations in my daily life, electricity and access to health and wellness. As a young nurse less than five years into my career, I was in awe of the female medical providers around me. Inspired by their drive and passion, the female Doctors and Nurse Practitioners were probably the most fit of any Americans on the trip, many of whom were the same age as my own parents, approaching each day with a childlike zest for life and sense of adventure of a young traveler. These women truly shaped the way I approached each day and often motivated me when the days got long or work became mentally exhausting. Some of these women have traveled with GVH in the past or completed aid work in other parts of the globe. In addition, our Guatemalan Nurse who joined the group was equally incredible, often the last to close shop in clinic, speaking with each and every woman of childbearing age, ensuring that everyone received the care and attention they deserved. As a young nurse in my late twenties, I am so grateful to One Nurse at a Time for this opportunity to touch the lives of others and be touched by the generosity of those around me. I cannot wait to experience the world from this vantage for years to come, to provide accessible, equitable healthcare to locals in their own communities whether stateside or abroad, and to hopefully inspire the next generation of health professionals after me.